02.11.2016. Cleveland, OH, USA. 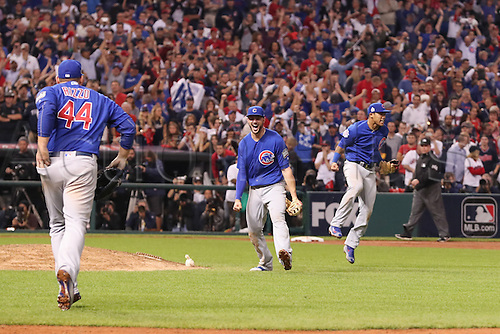 Chicago Cubs first baseman Anthony Rizzo (44) (left), Chicago Cubs third baseman Kris Bryant (17) and Chicago Cubs shortstop Addison Russell (27) celebrate after game 7 of the 2016 World Series against the Chicago Cubs and the Cleveland Indians at Progressive Field in Cleveland, OH. Chicago defeated Cleveland 8-7 in 10 innings.